The president says players should "proudly stand for the National Anthem, hand on heart, in honor of the great men and women of our military." WASHINGTON — Maybe President Donald Trump is getting tired of winning teams. Trump told the NFL champion Philadelphia Eagles not to bother showing up to the White House for a ceremony Tuesday honoring their Super Bowl victory in February, saying fans "deserve better" than a planned boycott by some of the team's players. Trump's decision, which follows a similar stiff-arm given to the NBA champion Golden State Warriors last year, comes amid a long-running cultural battle between the president and players who choose to kneel during the national anthem to draw attention to inequities in the criminal justice system. The Eagles had been scheduled to take part in the annual tradition, but several prominent players said they planned to skip the ceremony over Trump's criticism of player protests during the national anthem. In an unusual statement early Monday night, Trump said the Eagles "disagree with their President because he insists that they proudly stand for the National Anthem, hand on heart, in honor of the great men and women of our military and the people of our country." Trump added that only a "small number" of players planned to come to a White House ceremony anyway; the Philadelphia Inquirer reported the total was fewer than 10. Philadelphia Mayor Jim Kenney said in a statement late Monday that City Hall would be open to celebrating all of the Eagles players, and that he was proud that they are willing to "stand up for causes they believe in." And the players’ union tweeted early Tuesday morning that it was “disappointed” by the White House’s decision. Trump has repeatedly denigrated athletes who don't stand for the national anthem at campaign rallies and on Twitter. Vice President Mike Pence attended an Indianapolis Colts game last season and then left as soon as the expected protest took place. Late last month, NFL owners announced a league-wide policy requiring players and team personnel to stand for the anthem if they are on the field when it is played. Teams can be fined if their employees sit or kneel, and the teams can choose to fine personnel. It was Trump who demanded in September that NFL teams "fine or suspend" players who don't stand for the anthem. On Monday, Trump appeared eager to drive a wedge between the Eagles' players and their fans. "The Eagles wanted to send a smaller delegation, but the 1,000 fans planning to attend the event deserve better," he said. "These fans are still invited to the White House to be part of a different type of ceremony — one that will honor our great country, pay tribute to the heroes who fight to protect it, and loudly and proudly play the National Anthem." The new ceremony, scheduled for 3 p.m. ET, will "celebrate America" with performances by military bands, he said. 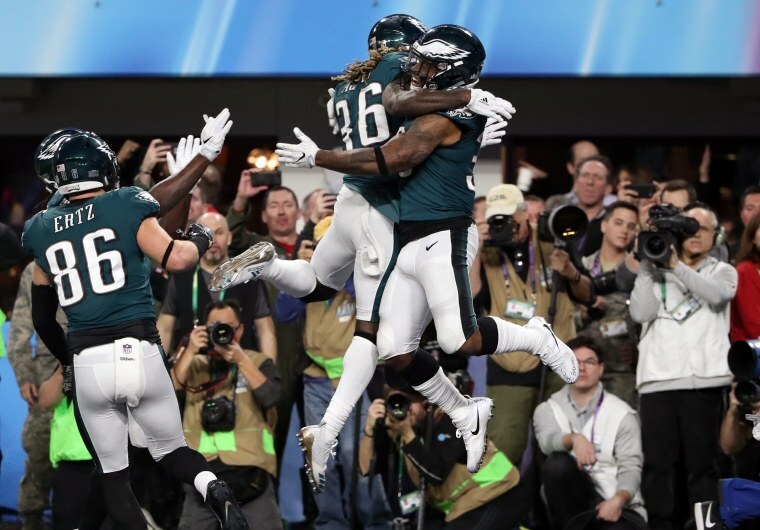 The Eagles had previously said the team would attend the ceremony as an organization but leave it up to individual players to decide whether to join in. Several — including Pro Bowl safety Malcolm Jenkins, a leader and organizer among players who have chosen to protest during the anthem — said they didn't want to go. The Eagles' owner, Jeffrey Lurie — who was secretly recorded calling Trump's presidency "disastrous" — said after the policy was announced last month that "there are so many people who are hurting and marginalized, which is why I am proud of our players for continuously working to influence positive change." Although he has often taken aim at African-American athletes, and although the protests are designed to highlight racial disparities in the justice system, Trump has denied that his criticism of players is intended to sow racial discord. Sen. Bob Casey and Rep. Brendan Boyle, both Democrats from Pennsylvania, quickly invited the Eagles to the Capitol, and Boyle trolled Trump on Twitter. Meanwhile on Tuesday, Fox News apologizing for using footage showing Eagles players kneeling in prayer before games during a news segment about anthem protests. In a statement to USA TODAY Sports, Christopher Wallace, the executive producer of "Fox News @ Night," said the footage was "unrelated" to the subject matter at hand and apologized for the "error." A poll conducted by the market research company Morning Consult after the anthem policy was announced suggested that 53 percent of adults approved of the rules, while 32 percent disapproved and 15 percent didn't know or had no opinion. In September, when Trump pressured the NFL to punish players and withdrew the Warriors' invitation to the White House, former Republican National Committee Chairman Michael Steele accused him of intentionally dividing the public. "It's very disappointing — the same level of stuff we get from the president that doesn't advance a genuine conversation but polarizes people into camps," Steele said at the time. "This is asinine." Jonathan Allen reported from Washington. Alex Johnson reported from Los Angeles.